The 2-person Relay is your chance to join up with 1 other person to take on the 26.2 mile marathon course through scenic Knoxville as a team. The marathon course has been designed to show-off Knoxville and run through several of its fine neighborhoods. We know that this year, the neighborhoods along the route are planning some great support. FINAL RELAY INSTRUCTIONS FOR RACE WEEKEND! Final relay instructions for race weekend are now available. Click here to view the final instructions sheet. NOTE: The legs are NOT of equal length. The first leg is 12.8 miles. The second leg of the 2 person relay is 13.4. Please plan your relay accordingly. Important: Transportation to and from relay exchange points is NOT provided. A little planning ahead can save a lot of confusion on RACE DAY! PLEASE familiarize yourself with YOUR RELAY ZONES LOCATION BEFORE RACE DAY. ALSO, sharing a vehicle can greatly reduce traffic and parking issues, for instance, Runner number TWO can RELAY keys to runner number ONE when exchanging the relay slap bracelet. This procedure can be done at each RELAY ZONE. The relay race will finish in World’s Fair Park. All relay team members will be allowed meet under the Clinch Avenue Viaduct and enter the finish chute to cross the finish line together. 7:30 a.m. on Sunday, March 31, 2019. The first relay participant will complete his or her part of the course and then pass their slap bracelet to the next member of the team, with the 2nd runner crossing the finish line. The team will receive one time and be racing against other 2 Person Relay teams only. NOTE: If the first person wishes to cross the finish line with their partner, they can wait outside the finish chute at World’s Fair Park for their partner and finish together. All Relay participants will receive a t-shirt and goody bag at the Health & Fitness Expo on Saturday, March 30. All Relay Finishers will receive a finisher’s medal, a commemorative finisher buff from Mortgage Investors Group, and can enjoy post-race food and refreshments at the Pilot Flying J Post Race Party. MANDATORY Packet Pick-up will be held at the World’s Fair Exhibition Hall (935 World’s Fair Park Drive), site of the Health & Fitness Expo. NOTE: There is NO Race Day Packet Pick-up. The marathon relay course will feature 18 runner refreshment stations. Each station will feature Powerade and Mountain Valley Spring Water. There will also be four gel stations, at approximately the 6.3, 16, 21, and 23 mile marks. The team must be able to complete the course, whether running or walking, in 7 hours. The course will be rolled-up at a 16 min/mile pace. At a pace slower than this, you will need to move to the sidewalks and proceed toward the finish. The finish line will remain open for 7 hours. This year’s event will finish at World’s Fair Park. We’ll have music, refreshments, and live music after you are finished! On course, we will have plenty of portable toilets. They will be near (but not right next to) every water station. There will be 5 at each of the first 6 water stations, 4 at each of the next 9 water stations, and 2 at each of the final 3 water stations on course. There will also be plenty available at the start, on both the concourse of the Knoxville Convention Center and the plaza terrace level of the KCC. Plenty of medical support will be available throughout the course, at the finish line, and at the Pilot Flying J Post Race Party. Mobile medical support units will be positioned every couple of miles along the course. There will be a first aid area after the finish line. Covenant Therapy Centers will also be available to aid in stretching at the Pilot Flying J Post Race Party. 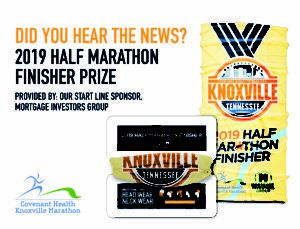 The Covenant Health Knoxville Marathon has an Event Alert System. Click here for more information about the EAS.